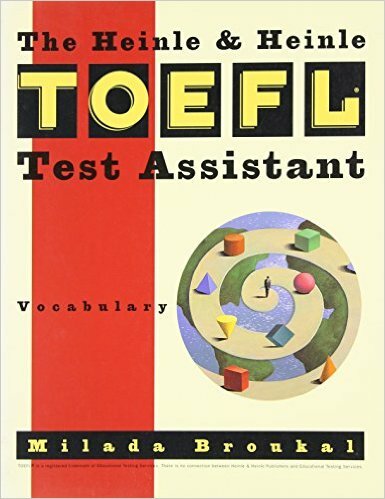 The Heinle & Heinle TOEFL test Assistant: Vocabulary is a vocabulary building text that prepares students to meet the vocabulary needs in all sections of the TOEFL test; i.e., Listening Comprehension, Structure and Written Expression, and Vocabulary and Reading Comprehension, in a variety of ways. Each section of the test has different vocabulary needs. The Listening Comprehension section requires vocabulary in the form of idioms, phrasal verbs, everyday and specific vocabulary. The Structure and Written Expression section tests knowledge of suffixes, and of confusing words. The Vocabulary and Reading Comprehension section requires looking for contextual clues that reveal the meaning of a word. This comprehensive text addresses all the vocabulary needs of the student. 2. Theme Grouping: Living Things. 3. Theme Grouping: Time and Space. 4. Everyday and Specific Vocabulary. 6. Theme Grouping: Thought and Communication. 7. Theme Grouping: Feelings and Sensations. 8. Idioms and Confusing Words. 10. Theme Grouping: Places and Movement. This series focuses on the language skills and test-taking strategies students need to perform well on the Test of English as a Foreign Language and the Test of Written English.